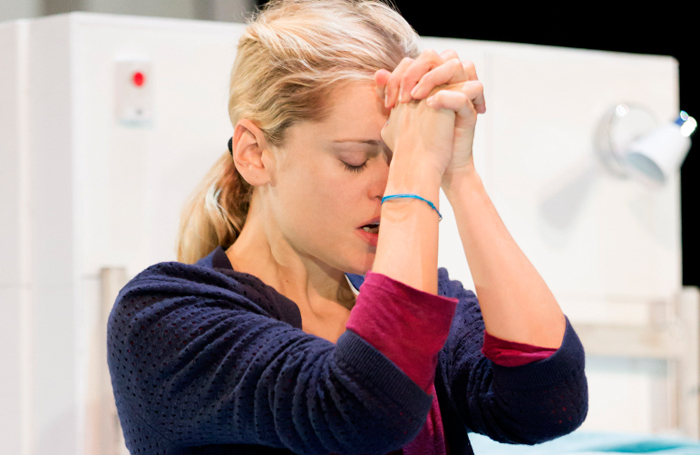 When People, Places and Things opened in the Dorfman at the National Theatre last year, critics immediately credited the show’s star, Denise Gough,  with performance of the year. Following widespread acclaim for her portrayal of troubled protagonist Emma, Gough went on to win Best Actress at the Critics’ Circle Awards, and now returns for the West End transfer of this Headlong and National Theatre co-production. Duncan Macmillan’s play follows Emma’s journey from addiction, through rehab, and towards recovery. But it’s no simple tale of adversity; Emma is an actress – fiercely intelligent – and from her anguish bursts questions of truth, morality and the most terrifying thing of all: survival. Gough is supported by Barbara Marten, Kevin McMonagle, and Nathaniel Martello-White alongside a number of supporting roles. Jeremy Herrin directs, with set by Bunny Christie, music by Matthew Herbert, and movement by Polly Bennett. Megan Vaughan rounds up the reviews. That mixture of mercuriality and restraint runs through many of the responses. “Crucially,” says Marianka Swain, “Gough fully earns our investment in her emotional journey, through trauma, grief and the day-by-day process of healing, by never openly courting it.” Mark Shenton too (LondonTheatre, 5 stars ) finds the light and shade in “acting so raw, so tangible, so felt, so passionate, so wounded yet alive, so down but never out”. Perhaps inevitably for a story told through the eyes of such a magnetic protagonist, a few critics bemoan the lack of opportunity for supporting cast to shine. Swain feels they “don’t progress much beyond a quick summation”, while Bennion complains that “too many of Emma’s fellow patients speak in quasi-poetical terms about their own addiction – ‘I was a dog without an owner’, or, ‘I was a scream without a mouth’. People, Places and Things is told through what Marianka Swain calls Emma’s “graphic subjectivity” (“We share her nightmarish hallucinations, watching in dawning horror as bricks fly out of the walls … and multiple Emmas appear from nowhere, writhing in shared agony”) while Natasha Tripney recognises a “succession of masks” as references from Ibsen, Williams and Shakespeare are adopted by Emma for group therapy. Undoubtedly yes, very. From the big hitters, The Stage, Evening Standard, WhatsOnStage and Time Out all award 5 stars, and there are countless more 4s and 5s. “There is absolutely no doubt,” writes Fiona Mountford, “that Gough is the person, Wyndham’s the place and this play the thing to see this spring.” It certainly looks like this transfer will secure Gough’s reputation and designate Macmillan’s play a contemporary classic. We must recognise, however, that true consensus is never attainable, and no reviews round-up could be considered comprehensive without including the outliers. Chris Omaweng (LondonTheatre1, 1 star ) was so unimpressed by People, Places and Things that he spent much of the first half asleep, waking only to complain of “expletives left, right and centre” and compare the show unfavourably with Matthew Perry’s The End of Longing.